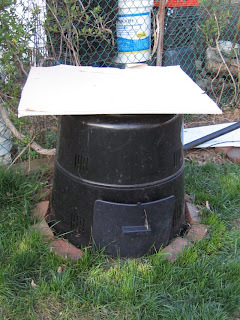 I got this composter from someone on Craigslist. I started trying to make compost last fall, thinking that by the summer, I'd have tons of compost. Yeah. Not so much. Apparently, if you put in a ton of branches, it'll take a ridiculously long time to decompose. You need to water it. When I picked up this bin and started forking it into a pile, I noticed that most of it was very dry and not doing anything. Apparently keeping it moist actually is important. Vegetable scraps disappear pretty quickly. Coffee grounds and filters disappear even faster! Once you actually figure out what you're doing, you might need to ask your friends and neighbors for their leaves because it starts shrinking very quickly. It helps to actually turn the stuff, or at least move it around. So far, I only have about an inch of compost, so keep your fingers crossed for me. Maybe by next summer I'll actually have enough to do something with. Earth Day for my "compost class".